I created this dove grey wedding cake for an exclusive project in the latest issue of Wedding Cakes & Sugar Flowers Magazine. 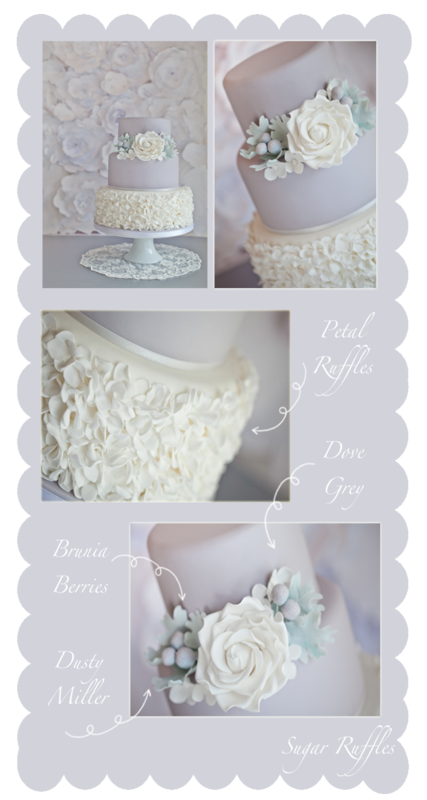 The cake features delicate petal ruffles, a large sugar rose, brunia berries, dusty miller and hydrangea flowers. I also created the wall of paper flowers seen in the photos. This would make such a stunning backdrop for any wedding cake table! The magazine features a full step by step guide for how to make the cake and is available here in print and now in digital too! The cake has also been featured on The Cake Blog, where you can find out a little more about my inspiration behind the design. My goodness, what a beautiful cake - the colours are superb and the attention to detail is amazing.